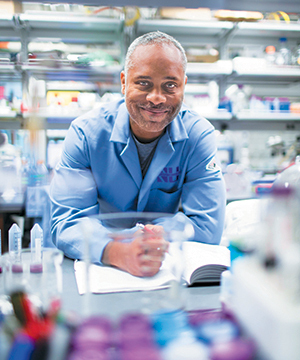 Guillermo Ameer positions Northwestern for leadership in regenerative engineering. The human body has the remarkable ability to heal and repair itself throughout its inhabitant’s lifetime. But sometimes, it can use a little help. Enter regenerative engineering. This rapidly expanding, inter-disciplinary field aims to jumpstart the growth of injured, missing, or diseased organs and tissue. It also promises to minimize, if not eliminate, many of the issues that challenge medical care providers the most, ranging from a shallow donor pool to the full spectrum of potential surgical complications. “There’s an unmet need for better solutions,” says Guillermo Ameer, the Daniel Hale Williams Professor of Biomedical Engineering and Surgery and a pioneer in the field of regenerative engineering. Over the past 15 years, Ameer and his team at Northwestern have stood at the forefront of this revolutionary science, developing a range of biomaterial solutions to promote healing and improve patients’ quality of life. Ameer believes he’s only glimpsed what’s yet to come. Ameer’s research group focuses on developing novel advanced liquid and solid-bound materials based in citric acid, a compound already present in the human body. The biomaterials, which range in size from nanoscale to macro dimensions, can be engineered to become scalable and reproducible tools specifically designed to promote tissue and organ regeneration in patients. The applications cover a host of issues ranging from cardiovascular disease and diabetes to torn ligaments and bladder disease. As one example, Ameer’s group developed a “regenerative bandage” to address chronic, non-healing diabetic foot ulcers, which affect about one in seven diabetics. The ulcers can lead to lower-leg amputation or even death. Ameer’s solution healed the diabetic wounds four times faster than a standard bandage and without any of the traditional side effects. In other research, Ameer’s team repaired a hole in a mouse’s skull by regrowing “quality bone,” a breakthrough with the potential to help those suffering severe head trauma. They also created the first-ever inherently antioxidant biodegradable biomaterial, a groundbreaking development that minimizes the negative effects often associated with a surgical implant or medical device placed inside the body. "We develop materials from scratch and work directly with users and industry to implement the materials into potential products,” says Ameer, who has published more than 250 scientific papers and has more than 45 patents issued or pending in nine countries. He has also conducted research in drug and gene delivery, patient-specific medical devices, and stem cell engineering. "I’m excited about translating the work we do in the lab to hospitals and one day having an impact on patient care worldwide,” he says. Though regenerative engineering is expanding in the United States and around the world—China and some European nations have made sizable investments in research centers and scholarship—Ameer says the field has reached a critical crossroads. While he and other investigators have unveiled promising innovations, additional scalable successes will be necessary to capture industry attention and propel broader impact. "These therapies can be effective,” Ameer says, “but to date, we have not had the big success stories we need to justify the process and the cost to scale up.” Ameer hopes Northwestern’s new Center for Advanced Regenerative Engineering (CARE), which is slated to launch this summer with Ameer as its founding director, will supercharge the field.